I hope my readers will forgive me if I admit that I chose to keep a discreet silence over the peaceful death of Itchy, the old sow at the Spitalfields City Farm last year, and instead to share my delight in beginning this new year by introducing these two beloved young squealers, Holmes & Watson. When I went along to take these portraits of Holmes & Watson in the sty that serves as their approximation to 221B Baker St, I did not know which was which. But, as you can see from the photograph above, it soon became visibly apparent that the smaller darker one possessed the keener eye and more remarkable faculties in general, and that one was Holmes. Helen Galland, the pink-haired farm manager, who plays the role of Mrs Hudson, providing food and housekeeping for these two bachelors, revealed she spotted the disparity when they first arrived at their new lodgings three months ago. “They like play-fighting, pushing each other out of the way to discover who is the dominant – and seemingly it is the smallest one!” she told me with a grin of astonishment. Little else is known of their early months, yet on this basis of these ominous words that I overheard from Holmes – whilst they were at the trough – we can only assume they are relieved to find themselves in Spitalfields, “It is my belief, Watson, founded upon my experience, that the lowest and vilest alleys in London do not present a more dreadful record of sin than does the smiling and beautiful countryside.” Subsequently, I was surprised to hear Watson confess, “I naturally gravitated to London, that great cesspool into which all the loungers and idlers of the Empire are irresistibly drained. 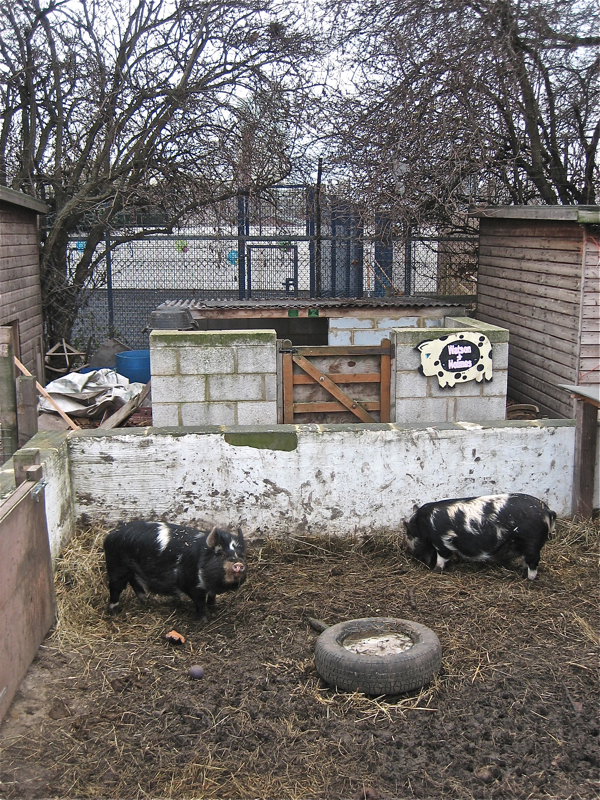 There I stayed for some time at a private hotel in the Strand, leading a comfortless, meaningless existence, and spending such money as I had, considerably more freely than I ought.” Let us be thankful that Holmes & Watson have found a satisfactory home now at the City Farm. I certainly enjoyed my brief opportunity to share the serenity of their existence whilst photographing the piglets in their pen, although I did become frustrated that they barely took their snouts out of the mud, until Helen helpfully explained that this is called,“the investigative instinct.” When she conjured this phrase, I could not help recalling the unfortunate break-in and abduction of a ferret at the farm a year ago and I wondered if this event might have proved a factor in the decision to bring in Holmes & Watson. 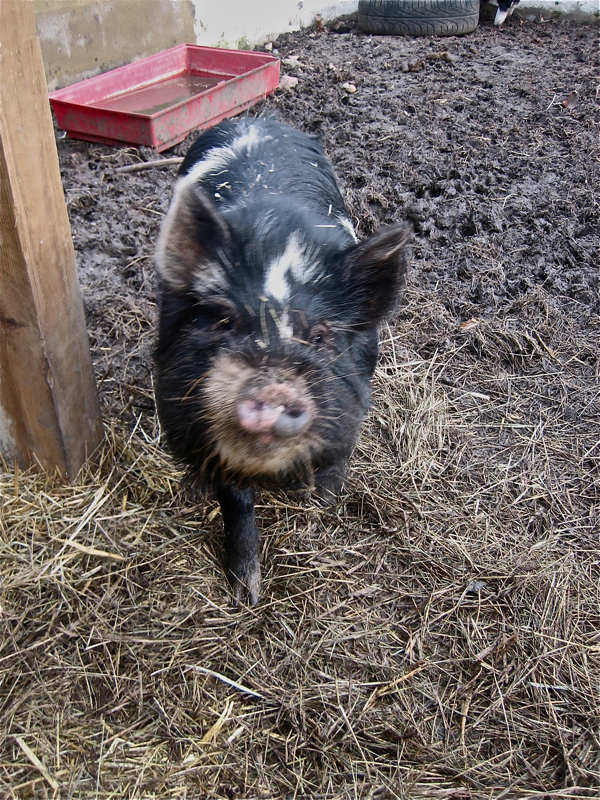 Yet at just six months old, it seemed premature to enquire about the crime-busting potential of these piglets. May it suffice to know that Holmes & Watson have ended up in clover. Watson keeps his nose to the ground, surveying the muddy details of the case. 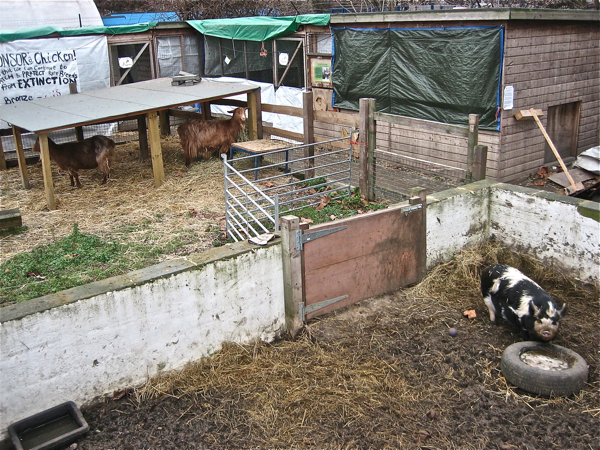 Bramble & Bentley, the twin goats, are Holmes & Watson’s neighbours at the farm. Oh literary pigs – how gorgeous! Very pleased to hear of their antipodean heritage as well. Hahah! Thank you Gentle Author for cheering me up on this gloomy January morning. 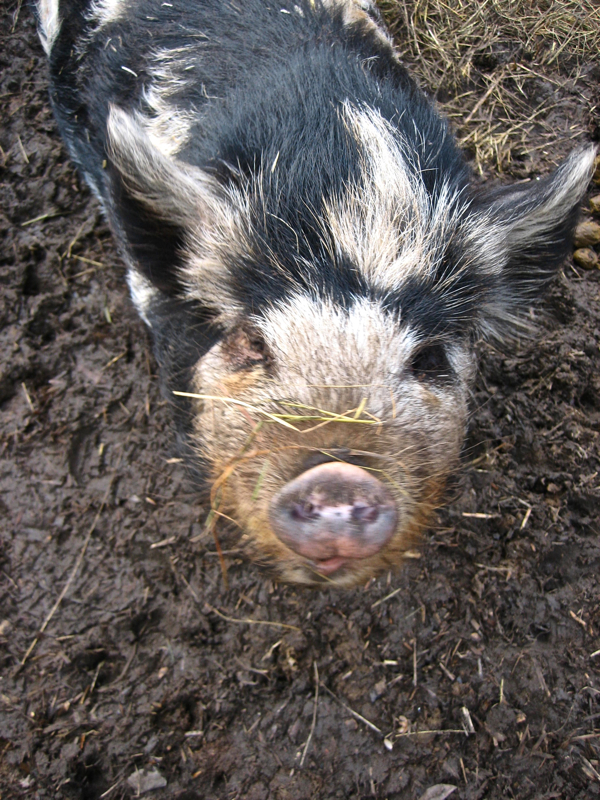 I visited the City Farm in June and just missed meeting the big personality that was ‘Itchy’. I am hoping to visit again in the Spring when I hope to have a stall at one of the fairs. These farms are wonderful places and to be celebrated. I exhibited my work at Freightliners Farm in Islington which is a bit posher than Spitalfields but I think Spitalfields may have the edge now on interesting animals with the arrival of Holmes & Watson. Brilliant! Your chortlesome captions are inspired. Why would Holmes and Watson settle into new digs in Spitalfields? Elementary, my dear Gentle Author, they have a ready chronicler in you! 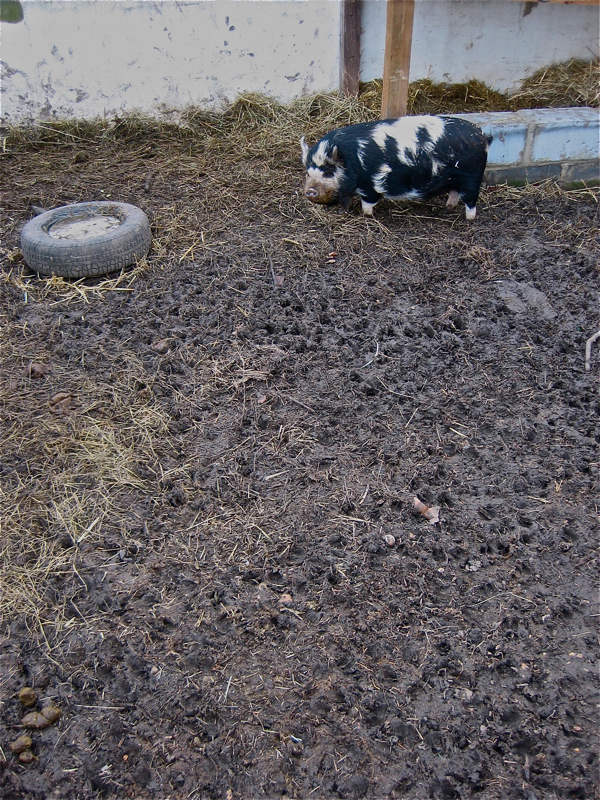 I anticipate many a tale to come — the Case of the Missing Carrots, the Mystery of the Muddy Snout, etc.